If Ellie finds any necklaces, hats, socks, pants, anything that is meant to be worn, laying around on the floor, she puts it on. Hehe! Love her adorable personality! 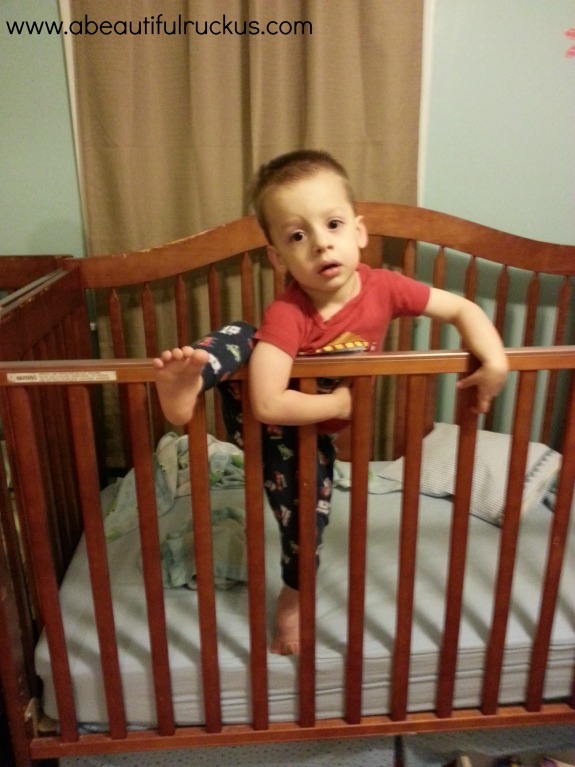 Just to be clear, Caleb doesn't have enough motivation to actually climb out of his crib, but I think he does this to try to fake us out. Nice try, buddy! I think we know you a little better than that! One of my quad mom friends, Kari Hickey, is a Scentsy consultant. She hasn't been doing it long, but has already paid for a couple of trips with her earnings! Anyhow, she surprised me with a package in the mail this week: Layers Body Spray and Layers Hand Cream in the Luna scent. I didn't know she was sending them and was so excited to see them in the mail. I smell AWESOME! Hehe! By the way, she runs specials all of the time on her FaceBook page. I've scored some great discounted deals in the past! If you are interested, you might want to check it out. Sean came home last night and told me that today was Jimmy John's Customer Appreciation Day. Their subs were only $1.00 each!! So I roped my friend Beth into helping me take the kids to lunch. It was so cheap! 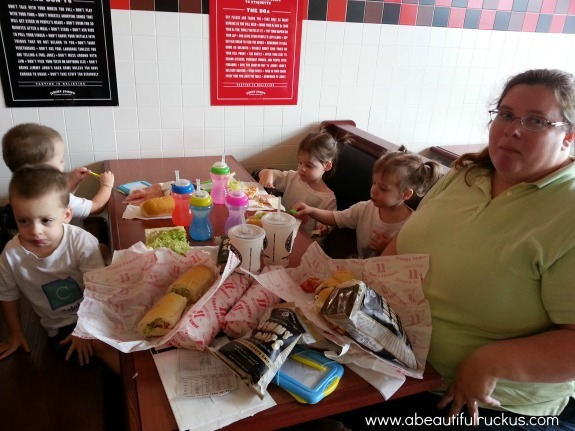 And it made me so happy to get to do something normal like going to lunch with a friend with my kids in tow. 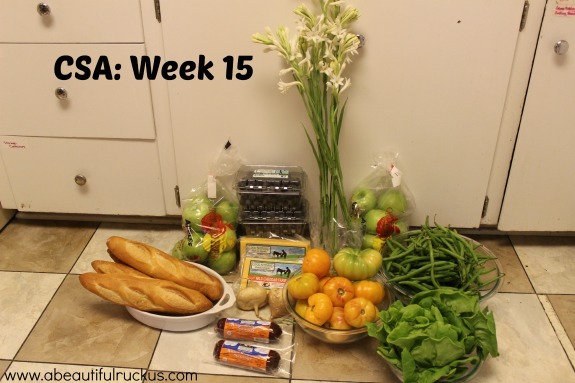 Week 15! Sean's coworker gave us her bag, so we got extra again! Four French baguette loaves, six pounds of green apples, two pounds of cheddar cheese, three pounds of grapes, two logs of bison summer sausage, 15 tomatoes, two pounds of green beans, two heads of butter lettuce, and six stalks of tuberose flowers! The flowers were a nice surprise! I love fresh flowers but can never justify buying them for myself. Wow, $1 subs! What a great deal! My husband is eager to try Jimmy Johns. Looks like you had a great week with a lot of things going on as usual, right?? I did not know that Scentsy had body products!!! Wow. Another discovery. And what a wonderful lunch that must have been---glad you had a friend to come along and help. Have a great weekend!!! I love my job for all the little things about it! I can now also add that two co-workers are taking me out from lunch next week because they know I've been stressed out. But the best part is that they didn't say that was the reason-they just said they want to take me out! Uh oh, one foot now, parties in the kitchen at mid-night tomorrow!!! 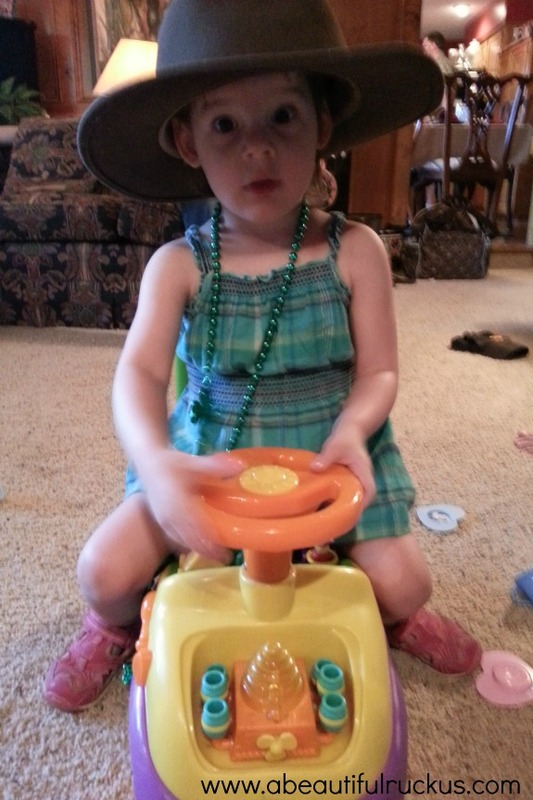 Love the Hat and Necklace, Abby. Such a sense of style.